Tap 3 area to cycle lcd panel modes. 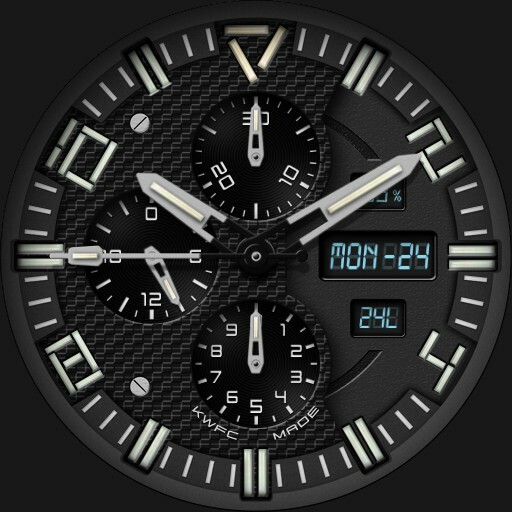 Tap 9 area to cycle 24 hour dial modes. Tap between 10 and 11 to cycle plate textures. Tap between 7 and 8 area to start/stop chrono. In Chrono mode Seconds hand is Chrono seconds. 24 sub hand is Chrono hours. Bottom sub is 1/10th seconds. Tap Center for dim mode menu. Tap Color text to cycle color. Tap Mode text to cycle dim modes Normal, Always On, Auto Always On, Auto Always Plus and Off. Tap X to close.